Injustice: Gods Among Us is currently the highest-selling e-comic in the world. And that was before the long-awaited video game came out! I put this down to the excellent writing of Tom Taylor, which manages the neat trick of sneaking a fair amount of fun and comedy (note the distinction) into this title amid the serious drama. The situation at the heart of this comic is undeniably serious, being built around a confrontation at Arkham Asylum between Batman and Nightwing and... well, pretty much the rest of the Justice League. Despite the tense situation, there is a fair bit of comedy. Robin, for instance, completely blanks on who the hell Calendar Man is as he's listing the various baddies that Batman is fighting to protect. 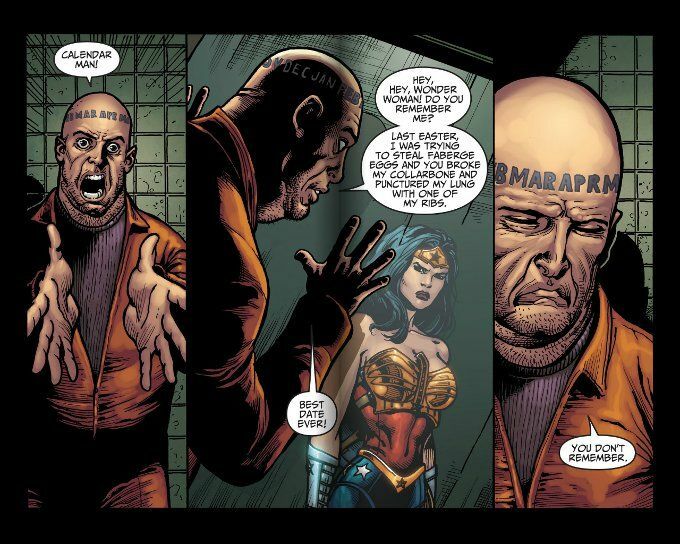 Calendar Man is naturally offended even before Wonder Woman doesn't remember their "date". There's also a humorous bit built around Nightwing's knowledge of the staff at Arkham Asylum and which members should not be left alone an inmate - even if they are in handcuffs. Tom Derenick is back on the art duties this week. He does as fine a job as ever, with one small problem. I don't know if it's a continuity issue or we're just mean to assume that Harley was able to slip her fake mustache on between panels. Either way, the story could have benefited from either depicting Harley in the mustache from the very beginning or taking a moment to show her slipping it out of her glove and onto her lips. If this seems an odd thing to single out, trust me - this is incredibly important to the plot! Really! If you do plan to pick up this issue of Injustice, be sure to download last week's issue as well. This issue is an immediate follow-up to that story and the flow of the action will be highly improved if you've read both issues. And believe me - you'll want to read as many issues of this comic as possible if you haven't been reading it already!